Secretary of Agriculture Tom Vilsack talks to Chuck Todd about why he thinks it's important to "maintain the integrity" of the Farm Bill. The Senate is on the cusp of passing a nearly $1 trillion agriculture and nutrition bill that affects everything from corn subsidies to food stamps to the cost of an acre of farm land. The huge piece of legislation, slated for passage Tuesday, is called the “farm bill” – and it has real-world consequences for the American economy, and for politics in 2014 and beyond. The biggest and most publicized portion of the bill is nutrition assistance, mostly food stamps, which will be cut by $8 billion, but there are plenty of other reasons to pay attention to what’s in it. You pay taxes: The measure will cost taxpayers $956 billion over 10 years. That’s a lot of money by most standards, but the Congressional Budget Office says the bill will cut deficits by nearly $17 billion, compared to prior law. Last year’s House version of the farm bill would have gone much further, cutting deficits by $50 billion. The new farm bill passed by the House yesterday and expected to sail through the senate, includes $8B in cuts to the food stamp program over the next decade. How will recipients be affected? Maragarette Purvis discusses. You or your neighbor have fallen on hard times: Even though the bill cuts spending on food assistance by $8 billion over 10 years (about 1 percent of the program’s total), taxpayers will still be spending more than $70 billion a year to help low-income people buy food, mostly through the Supplemental Nutrition Assistance Program, otherwise known as food stamps. You eat: The first farm bill was enacted in 1933. Since then, subsidies in the form of loans, direct payments, payments to offset falling prices, and subsidized crop insurance have become a way of life. The bill “provides a certainty and a safety net for farm families” enabling them to borrow money to buy the equipment, seed, and other inputs they need to produce their crops, said Missouri Republican Sen. Roy Blunt. Would the price of the rice you get with your Kung Pao chicken go up by five cents, or 50 cents, or not at all, were there no farm bill? You want bipartisan cooperation: Gridlock is the loser here. House Agriculture Committee Chairman Frank Lucas, R-Okla., said that while “many people criticize us and this body as dysfunctional,” this was one case where Congress functioned in a bipartisan way: 70 percent of House Republicans voted for it, as well as two-out-of-five House Democrats. You’re a Tea Party conservative or one of their adversaries: Tea Party conservatives tried to end the tradition that if you supported farm subsidies, you had to vote for food stamps since the two measures were packaged together. After scoring a short-lived victory last summer when the House passed a farm-only bill and stripped out nutrition assistance, conservatives lost in the end. 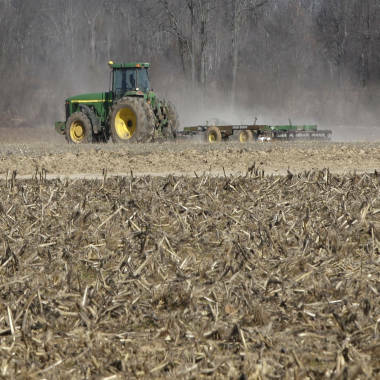 Last summer “we ended this unholy alliance between food stamp and farm programs … (and) defeated business as usual by passing the first farm-only farm bill in nearly 40 years,” said Indiana Republican Rep. Marlin Stutzman. You care about which party controls the Senate: The farm bill is an issue in the tossup Senate race in Arkansas, the nation’s leading rice-producing state.